Ideally, the process of scarifying your own lawn is a great way to improve its overall health in the long run. However, you also need to note that this method temporarily affects your lawn in a negative manner as it becomes aesthetically unappealing. In fact, a perfectly healthy grass plant can be ruined if scarifying is improperly conducted or done at the wrong time of the year. Thus, it is important to know when and how to scarify the lawn. With the right information, your property should recover as quickly as possible. Scarifying is not something you should randomly decide to do at any time of the year. It’s not advisable to simply dig down into the grass in an attempt to prevent the spread of thatch and moss underneath the growing grass. While thatch needs to be dealt with since it hinders plant growth by taking the nutrients and water for itself, the conditions need to be just right for scarifying. This ensures immediate recovery for your grass. If you’re planning a deep scarifying operation that will expose a sizable area of the soil, you should do it during autumn. Once the thatch, moss, and other organic matter that affect lawn health have been removed, there will be room for plants to grow. However, this also means that pesky weeds can take the new space. The best outcome here is for the scarified area to become a great seedbed, which is perfect if you wish to spread new grass seed. This is why scarifying in autumn is crucial. Since you are going to do it in autumn, it will be unlikely for the weeds to overtake the grass in covering the exposed ground due to their relatively slow growth. In contrast, scarifying during the spring season is problematic as weed growth is far faster at this time compared to autumn. In other words, scarifying during spring removes the thatch and the moss but invites bad grass weeds into your lawn. In order to properly scarify your lawn, the grass needs to be short and dry. Two weeks before the procedure, you should mow the lawn. Remember not to drastically increase the cutting height as this can lead to plant shock. As the grass height is shortened, more air could reach the turf and dry your lawn grass. One day before scarifying, mow the grass again as shortly as possible without scalping it. Likewise, all of the undesirable weeds in your lawn need to be removed one week before scarifying the area. Even though scarifying itself can stop the spread of invasive weeds, the better solution is still to apply an effective weed control product. While the grass should be dry, the soil needs to have an adequate amount of moisture. This will help your lawn to recover after a deep scarifying operation. If ever the soil is too damp or too brittle, you have to wait for the right soil conditions to arrive. It’s best to scarify the lawn on a dry afternoon. If it unexpectedly rains, just keep the grass height short and wait for the next dry day. In scarifying the lawn, you can use either a petrol scarifier or an electric-powered raker. With the former, you can easily go down deep into the soil immediately, but don’t do it. Just like mowing, it’s much better to gradually deepen the scarifying operation with each succeeding run. 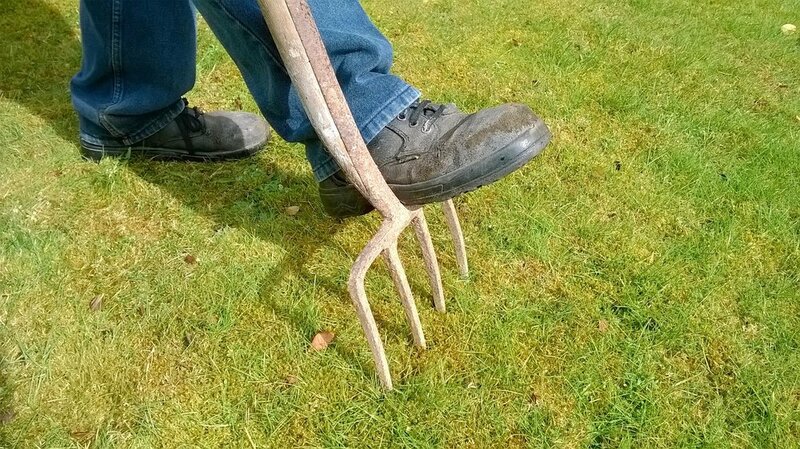 On the other hand, an electric raker will do just as well since it has wire tines for removing moss and blades for scarifying. Your scarifying machine will likely have a height adjustment feature to keep the blade and the wires in direct contact with the soil. Instead of removing chunks of your lawn, repeated runs with minor changes both in the direction and in the scarifying height will allow the moss and the thatch to be teased out. Lastly, don’t forget to have a collection box to remove all the debris that has been unearthed through scarifying. We hope that this quick guide helped you understand why scarifying is best done during the autumn season. Before the procedure, remember to have dry and short grass. Consequently, progressively increasing the scarifying height with each run is the best method. If you have any queries, feel free to give us a comment.